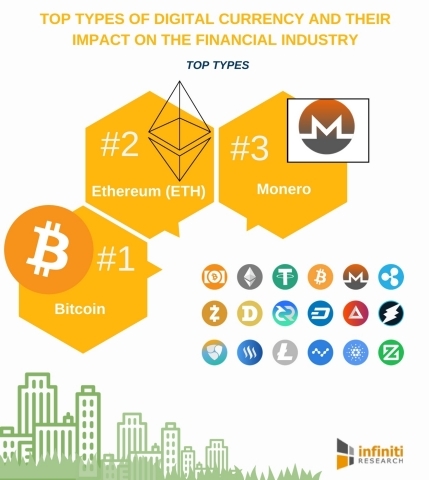 Infiniti Research, a world-renowned market intelligence solutions provider, has announced the completion of their latest article on the different types of digital currency and their impact on the financial industry. At present, there is a very small number of users who prefer digital currency. The outline for its regulation and the tax structure to control digital currency is still developing. It has two types, namely virtual currency and cryptocurrencies. Digital currency enables direct payments between payees and payors and eliminates infrastructure costs, intermediaries, and processing costs. It also allows the easy and transparent flow of funds. Digital currency is a payment method which exists only in the electronic form. Digital money has many advantages linked with it like easy and timely payments and smaller transaction costs. The acceptance of digital currency by the financial industry is less due to risk factors such as identification of payment beneficiary, vlatility of currency, regulatory compliance, and transaction risks. "Digital currency helps companies in the financial industry to eliminate the risk of exposure since they are highly secure," says an industry expert from Infiniti. Increase in efficiency: The use of digital currency will upsurge the effectiveness of the financial industry by making payments faster, easier, and most prominently more secure. The businesses in the financial industry will clearly witness many benefits from the use of this technology. Infiniti Research is a global market intelligence company offering strategic insights to help look beyond market disruptions, study competitive activity, and develop intelligent business strategies. Listed below are the different types of digital currency and their impact on the financial industry.